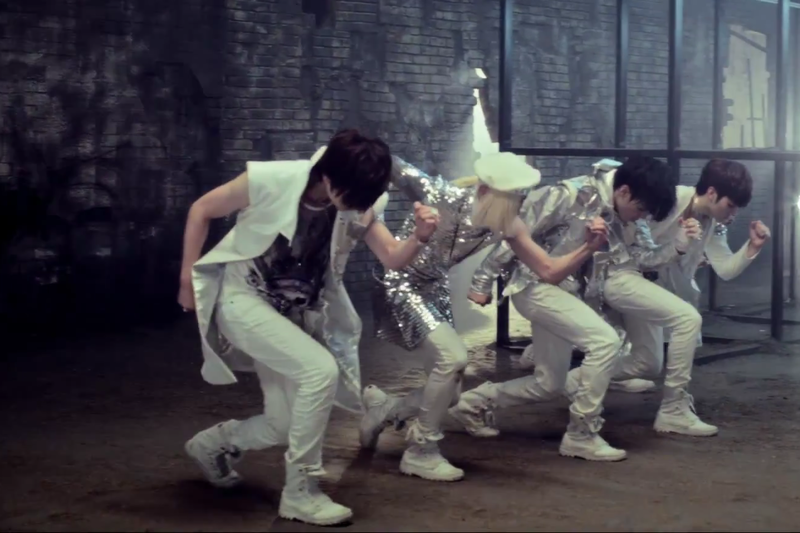 After making their debut onto the rookie K-pop scene with their catchy single “Face,” NU’EST, Pledis Entertainment’s latest and greatest boy group creation, has made a solid comeback with their first mini album and title song “Action.” Packed with plenty of silver accessories, sharp choreography, a little bromance, and even a message with some critical depth, “Action” delivers on its promise to bring the heat. With nothing to lose, these rookies pour out all their energy into this comeback single to make both the delivery and performance worthwhile. What I absolutely love about “Action” is that is sounds completely different than “Face” sounds. Whereas “Face” was a more typical scene-pop song, “Action” gets more artistic with its wardrobe and its 90’s pop synths and beats, giving NU’EST a little bit of a retro edge that is still fresh and funky. 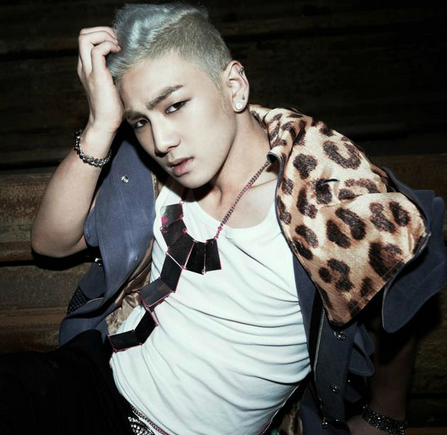 For rookies, NU’EST puts on quite the show–check it out for yourself! The MV opens rather dramatically, particularly with the way the choreography is timed with the intro, and sets a strong, commanding tone for the exposé. Because the song is about motivating one’s own inner, rebellious innovator, we begin the MV with the image of leader and major heart throb, JR, strung up like a puppet, fighting against the ties holding him down. The rest of the solo shots follow the same theme–Ren is bound in handcuffs and is hypnotized by replicas of his own wig, Aron is caught in a daunting iron jungle gym, and so on–the point is to illustrate the tension of being held back or entrapped. This follows suit with the temperament of the song, and eventually the boys physically break free as the song reaches a climactic peak to emphasize the meaning in the lyrics. Ready, incredible Action! Ready, amazing Action! Ready, incredible Showtime! Ready, your own showtime! Cinematically speaking though, this is still your average K-pop music video. While I appreciate how the stylists kept the wardrobe tame and yet trendy, I feel as though the color scheme was a bit dull, even with all that glittering silver. Besides the pop of pink provided by Ren’s lipgloss and necklace, I can’t recall any sort of contrasting color that made any one scene really stand out aesthetically. Also, I absolutely did not care for the dub step dance break. It appeared a bit excessive and really threw off the vibe of the song, which was shaping up to be fairly impressive until that short little number interjects. The delivery, however, was truly impeccably for couple of rookies. From the attitude to the performance of the choreo to the emotion threaded into the lyrics, I was shocked to see just how well NU’EST was invested in this production. Despite the color scheme being painted a few too many lackluster shades, there wasn’t a dull moment when it came down to the delivery, which ultimately makes up for otherwise the dip in aesthetic. NU’EST truly sparkles with talent, and it’s not just because of the silver-plated outfits and bright lighting. There is something very un-robotic about their confidence, and I say that in all seriousness. Too many rookie idols debut with an arsenal of rehearsed and full proof expressions that eventually just get old and predictable. But NU’EST somehow is able to shake that rookie stiffness and swagger forth with plenty of conviction, and that confidence makes them all the more attractive. As far as X-factor goes this MV has it fair share despite it’s rather typical presentation. Consider again the 90’s pop feel the song has–this dash of retro makes this track very unique and fun to listen to. Also, the lyrics to the song take on a very positive message (one not about love or heartbreak or the like), which is going the extra mile in my book, given how so many young people are fans of pop idols and look up to them as example even in their own life. The MV, however, is still nothing intellectually stimulating or blindingly ingenious, so the marks in this category don’t run as high. That’s a rap! Be sure to follow NU’EST’s action packed comeback with their latest song “Action,” and decide for yourself just how jazzy and innovative these rookies are!